Let&apos;s be real. The only celebrity gossip most Angelenos actually care about is intel on what&apos;s going on with our local mountain lions. Did P-22 really try to eat a koala at the L.A. Zoo? How&apos;s P-42 navigating her troublesome teenage years? What happens when a mountain lion decides to visit a high school? And so on, and so on. 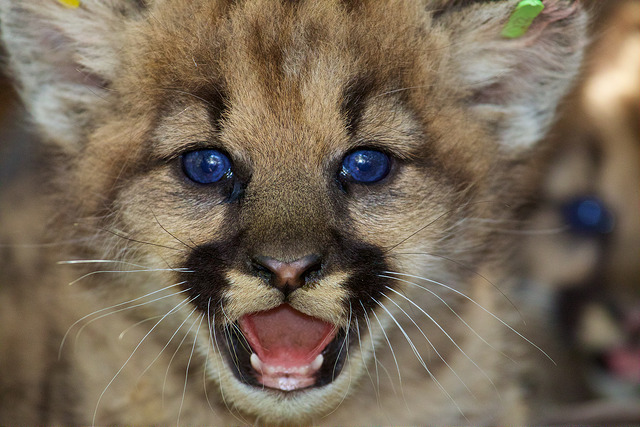 Rest assured, Angelenos, for the National Parks Service tells us that they&apos;ve recently discovered two new litters of (absolutely adorable) mountain lion kittens in the Santa Susana Mountains. Five kittens, two males and three females, were born to two different mothers back in May. Parks Service employees discovered the first den, home to two female kittens named P-48 and P-49, back on June 8th. The kittens&apos; mother is the roughly six-year-old P-35, who at one point shared a meal with some local bears. The second litter of kittens, two male and one female, belongs to P-39. NPS workers discovered that den on June 22. The father of all the kittens is suspected to be mountain lion P-38. 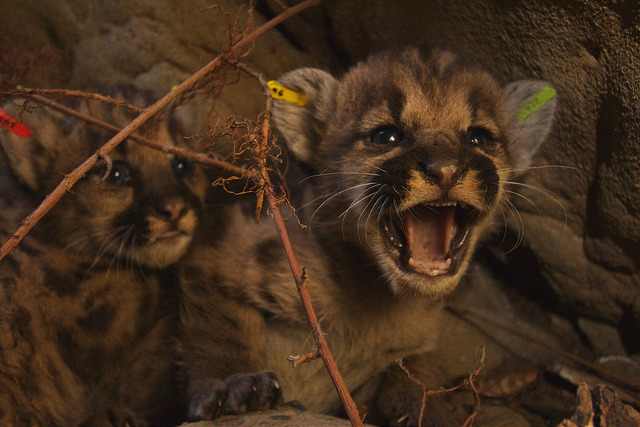 As a part of its efforts to more thoroughly understand the natural areas around Los Angeles, and how the life in those areas react to living in the shadow of an enormous city, the National Parks Service has attached GPS locators to several mountain lions in the hills surrounding L.A. Jeff Sikich, the biologist with Santa Monica Mountains National Recreation Area who actually went out to the dens themselves, explained to LAist how he used collected GPS data when he went to find the dens, and was reasonably sure he would find kittens inside. "Months ago we saw both of the females spending lots of of time with the male, P-38. We saw they had each spent about two or three days with him. 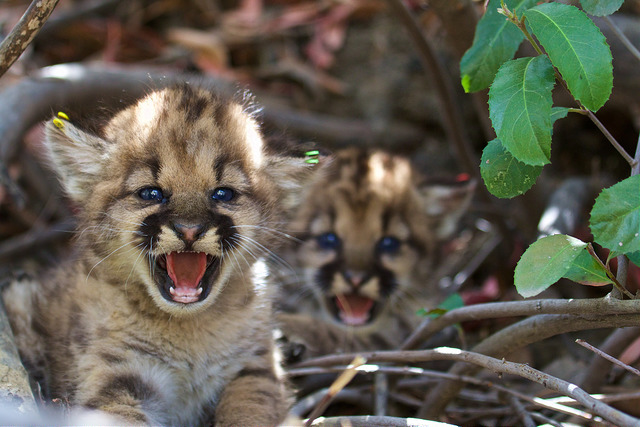 Mountain lions are solitary creatures, usually only together if they&apos;re breeding," Sikich said to LAist. 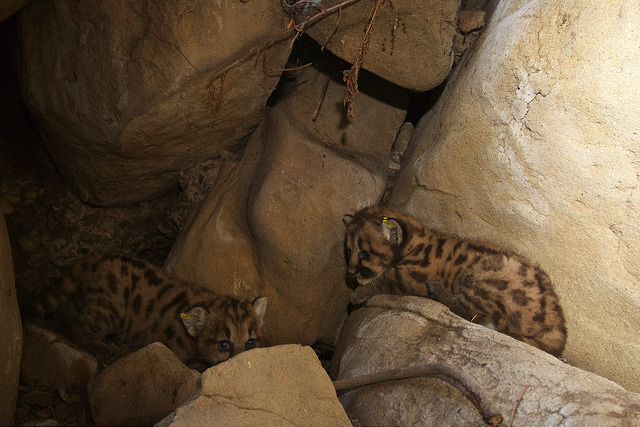 Gestation in mountain lions is approximately 90 days, so Sikich figured that looking for GPS location clusters roughly three months after the females had been in the same area as the male would pinpoint the locations of the kittens. "We made sure to look only when we know the mother is away from the den. P-35&apos;s den was in a real thick brush, and P-39&apos;s den was located inside a small rock-cave that I had to climb down into," said Sikich. "Once I find the kittens, I place them into a pillowcase and take them to a work-up station roughly 50 to 100 meters away. There, assess them, take measurements, take samples to test for diseases and tag them before returning them to the den." 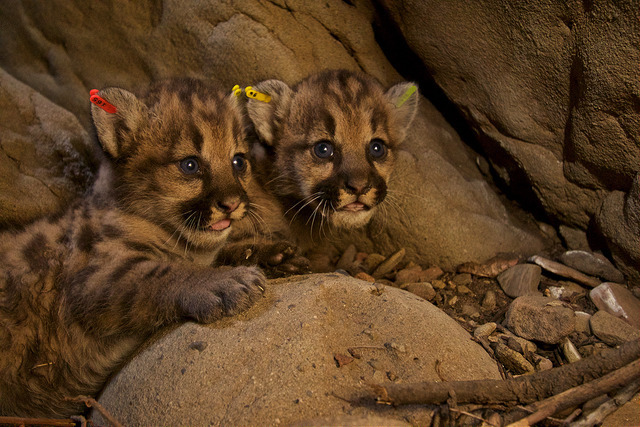 Mountain lion cubs will remain with their mother for roughly 12 to 18 months after birth. Often times the biggest challenge for newly independent mountain lions is simply finding a suitable habitat. Freeways create practically impossible-to-navigate barriers, bordering the animals in to the habitat where they were born. According to Sikich, a total of 11 mountain lions have been killed with trying to cross roads in the Los Angeles areas. "We&apos;ve picked them up on all major freeways like the 101, the 405, the 118, the 5, and the 126. They&apos;ve also been struck on some of the secondary roads in the Santa Monica Mountains like Kanan and Las Virgenes. Presently the National Parks Service is tracking 14 animals in the region.